I first heard about Hour of Code on Twitter which is my best source of inspiration! I saw several tweets about it, but really didn't think about jumping in until Andy Plemmons invited me and several other teacher-librarians to plan together via a Google Hangout about how to implement at our schools and in our libraries. It was my first group planning experience via GHO. Andy, Shannon Miller, Shawna Ford, and Cathy Potter (along with her Tech team) brainstormed about how to connect during the week and what apps/programs would be best for introducing it to our various age groups. It was great to hear others say they hadn't taught anything like this with their students before. That made me feel much braver about jumping in and giving it a try. I sent out an email and invited the whole school K-12 to participate. I knew it was extremely bad timing -- the week after Acuity testing and the week before finals, coupled with the end of the semester and winter break -- but I hoped I would have a few teachers able to fit it in. I decided I would definitely have my 8th grade Language Arts enrichment class explore the site and see where it led us at the end of our 9 weeks together. Middle school math teacher, Mr. Klyczek, agreed to devote a day to bringing all of his classes to the lab for us to code together. (He teaches all of the 6th graders and 2/3s of the 7th graders!) I also showed the 2nd and 3rd grade teachers the sites most appropriate for their students (Blockly, Tynker, & Scratch). Since they're 1:1, they felt they would be able to facilitate the lessons in their classrooms. When I introduced the Blockly site to my 8th graders, I was simply amazed. I watched my students (honestly a class that ordinarily isn't exactly motivated to work) become engaged in problem solving. At first there was the usual "this is too hard! ", but when I challenged them to see if they could beat me to level 20 by the end of the class period, it was ON! 8th graders began offering tips to each other, collaborating to conquer each level. The next day they wanted to know could they do it again! We set up accounts and decided to devote our last 2 weeks together to working through all the levels/tutorials we could at http://learn.code.org/ A few students quickly became known as our Coding Ninjas as they sped through level after level. Watching these students swell with pride as other students asked them for help has been priceless. My Coding Ninjas even offered me a few tips when I became stuck too. Towards the end of the week, a few of my students branched off to explore Scratch and another is designing an iphone app, but all agree that computer coding is way more fun than anything else we've done during our 9 weeks together. My Friday of coding with Mr. Klyczek's math classes was amazing! We showed the introductory video and encouraged the students to ask each other for help before asking us or giving up. We watched class after class of 6th and 7th graders achieve level 20 before the end of the class period. 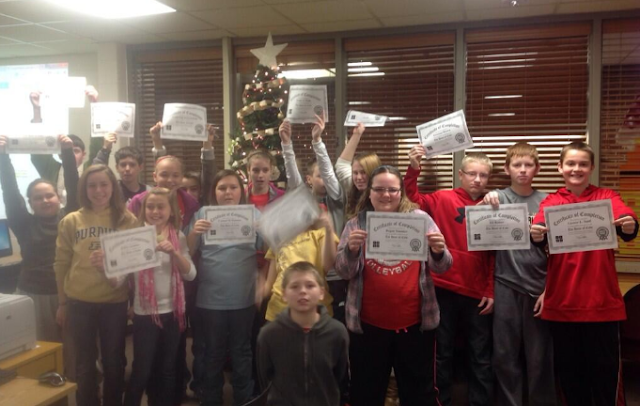 We printed certificates, took pictures, and celebrated each line of code written. All in all, it was one of those days when you wish every day of school could be exactly like that: engaged students, learning and collaborating together, working at their own pace. When I briefly visited 2nd grade, the students clamored to tell me what level they had achieved on Blockly and shared that most of them were spending recess time on the hour of code website. Definite success! A two hour delay put a damper in my plans to visit a 1st and 3rd grade class to get them started on the coding site, but I'll be visiting them next week before break. Also, next week, we plan on connecting again with Andy's students in Georgia and Shannon Miller's Van Meter students in Iowa for the students to share their experiences and coding creations. Good stuff! Even though Computer Science Education week/Hour of Code was December 9-15, if you didn't participate on your own or with students, you can still add it to the top of your list of lessons to try! I promise, you won't be disappointed. Our class had a great time with all the activities with Hour of Code, too. Great sharing here. Thanks so much for this great post and ideas. Was looking for something that would help K12 librarians understand why coding is something that is relevant to therm - perfect! Will be sharing this with an online workshop group that will be delving into coding in a few weeks. You're welcome! Thanks so much for reading!